COBIT 5 has become a leading framework for IT governance, but how exactly does it work, and what are the benefits? In this video, Mike from Good e-Learning looks at the purpose, makeup and value of the COBIT framework when it comes to enterprise IT. Contact Good e-Learning today to find out more! As we move further into the digital age, information has become an invaluable resource. Organizations utilize information in order to create essential products and services, and without proper information management and IT governance businesses can quickly start losing ground to more optimized competitors. When it comes to information and IT governance, professionals often talk about the COBIT 5 framework. But what is COBIT, and how has it benefited so many businesses? In a nutshell, COBIT is a business-focused framework designed to help organizations optimize their use of information and technology. The methodology ensures alignment between business needs and IT solutions, not only helping to create clear and actionable strategies but also boosting the value of IT for stakeholders. 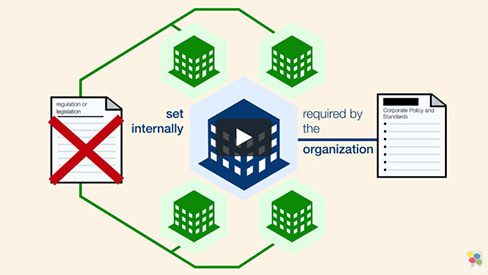 In this video, Mike from Good e-Learning looks at the benefits of COBIT 5 for organizations. Good e-Learning is a leading online course provider, covering not only COBIT 5 but also several other immensely popular frameworks and standards such as ITIL, TOGAF, Lean and Six Sigma. We focus on delivering engaging courses for students, doing away with endless slides in favor of modern tools like gamified quizzes, interactive videos and motion graphics. We can even create bespoke courses built around the unique learning requirements and KPIs of our customers. The Good e-Learning IT governance and compliance portfolio offers a number of choices for students. The COBIT 5 Foundation course provides an excellent introduction to the COBIT framework, complete with 24/7 tutor support and FREE exam vouchers for when students are ready to become certified. We also offer a combined COBIT 5 Foundation and GDPR Implementation suite for students interested in using COBIT 5 to ensure GDPR compliance within their organization. Interested in hearing more? Browse our full portfolio of Business & IT courses or visit our FREE downloads area for a wide range of posters, whitepapers, case studies and more from leading industry experts.